Five years ago, I wouldn’t touch philosophy with a barge pole. I was nearing the end of my physics degree, and this had provided me with an adequate enough explanation of the workings of the cosmos. Philosophy, in my view, was obsolete – important to the Ancient Greeks, but of about as much use today as an inflatable dartboard. Who could need frustratingly unprovable ruminations on the nature of life when physics provides handy, bitesize equations with which to describe the universe? But philosophy has since come back to bite me on the backside. It all began soon after I was given a cartoon version of the history of philosophy. My interest piqued, I started to read more about this mysterious topic, with its cast of eccentric thinkers and horse-hugging madmen. 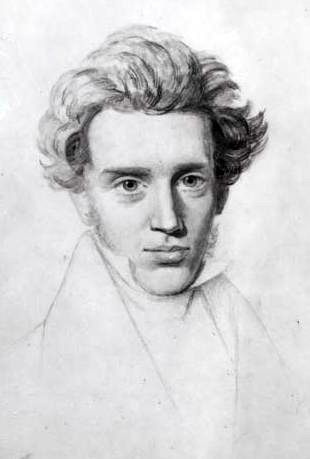 The first philosopher to catch my attention was Søren Kierkegaard, a rather dandy-looking Danish fellow who lived during the 19th century. I was intrigued to find out how he maintained his Christian belief despite being an existentialist, and how he maintained his wonderful quiff despite living 100 years before the invention of Brylcreem. Then I stumbled across Werner Heisenberg’s book Physics and Philosophy, in which he discusses the implications of his uncertainty principle, a key concept of quantum mechanics. Reading through this, I began to realise that philosophy and physics aren’t such enemies after all. Heisenberg’s uncertainty principle, which says that it’s impossible to simultaneously measure both the position and momentum of a quantum particle, opened up a can of worms for philosophers. If we can’t be certain about the properties of fundamental particles, what does that say about our knowledge of nature? The dialogue between contemporary physics and philosophy arguably began when Isaac Newton went apple spotting sometime during the 17th century. By showing that the motions of all bodies could be described by a beautifully simple set of equations, Newton hammered a nail into the coffin of those who believed in free will. If everything is governed by universal laws, then our actions as human beings must follow the same rules. Goodbye freedom, hello determinism. But free will was resuscitated by quantum physicists, who revealed that some uncertainties are fundamental to nature. Albert Einstein, a stolid determinist who famously believed that “God does not play dice”, saw this as a messy imperfection in quantum mechanics, trying to fix it by adding extra ‘local hidden variables’. Unfortunately for determinists, this theory was later disproved. Einstein’s formulation of special relativity, on the other hand, has stood the test of time. This theory is another source of philosophical debate: one of its consequences is that space and time are interwoven, and that both space and time came into being at the Big Bang – a situation which is similar to the Christian view of creation. So advances in physics have tended to pour petrol, rather than water, on the philosophical bonfire. And there are plenty of other research areas that provoke debate amongst philosophers: evolution, neuroscience, and genetic engineering being a few examples. There’s also the branch of philosophy concerned with the more general aspects of science, pioneered by Karl Popper, Thomas Kuhn, and others. The questions raised by these philosophers strike at the very heart of science: “when can a theory be said to be universally true?”, “how objective is science?”, “is scientific progress linear or subject to ‘paradigm shifts’?”. And as well as helping to fuel philosophy, science owes its very existence to the ancient philosophers and their forays into understanding the world around them – the animals, shapes, and celestial bodies that they observed. Logic, an early branch of philosophy, went on to become one of the cornerstones of computer science. Given that science and philosophy are so intertwined, I sometimes wonder why I was skeptical about philosophy. Maybe I bought into the cliché of philosophers as aloof types who pontificate about the nature of a chair. Maybe I was just put off by all the long words. But whilst there are some brain-meltingly abstract ideas in philosophy (epiphenomenalism, anyone? ), there are, thankfully, people who make the subject more accessible, explaining how philosophy’s influence can be found lurking in the most unexpected places. 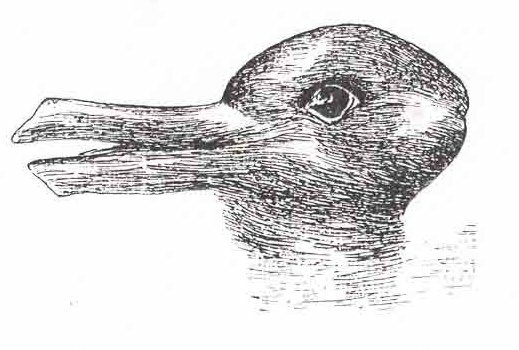 Images: Søren Kierkegaard; Werner Heisenberg, Dice, Duck-Rabbit Illusion. James Lloyd studied physics at university and recently finished a climate science PhD. He has now swapped semiconductors for semicolons, blogging about science at The Soft Anonymous and contributing to the online magazine Guru. When not doing sciencey things, James enjoys music making, hill walking, and trying to find the perfect flapjack. You can find him on Twitter here.